"Morons, your bus is leaving!" "What if there is no tomorrow? There wasn't today." "He might be okay." (truck explodes) "Well, no, probably not now." If you haven't seen it a hundred times, you are missing out. But I digress! According to Mr. McGregor's Daughter, today is Houseplant Census Day! At the McC house, censusing the plants is no small task. Luckily I maintain a list so it just needed to be updated. I had no idea how many plants I own, so I looked forward to learning the total. This picture of the plant room/breakfast nook was taken a year ago. The room is nowhere near this orderly anymore. How many houseplants do I have? Only 86?! Well, that's kind of disappointing. Guess it's time to go shopping! All but a handful are in two rooms, so at least the local density is high. The total does not include various cuttings in water, or the ginger and avocado experiments, or the hibiscus overwintering in the basement. If I include those, I'm right near 100. Most common families: Araceae (10) and Gesneriaceae (9); also Ruscaceae (7) and Cactaceae (6). Oldest plant: No idea! 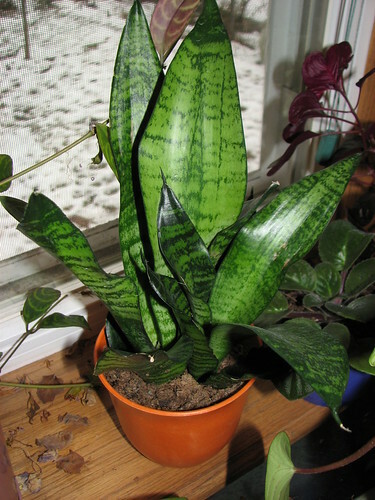 but probably one of the pothoses or spider plants or the larger of the two Ficus benjaminas. We went through a bottleneck in 2000 during the home remodel and I know the ficus is one of the few plants to survive that tumultuous time. Newest plant: Dracaena deremensis 'Lemon-Lime', purchased a couple weeks ago on clearance at Home Depot. Favorite plant: Aww, I love all my babies equally! But I love Bowiea volubilis, the climbing onion, especially equally. Least favorite plant: The orchids. The flowers are too fussy and overengineered, if they bloom at all. Also not crazy about the Scheffleras, although I do love the new leaves when they emerge, like tiny grasping hands. 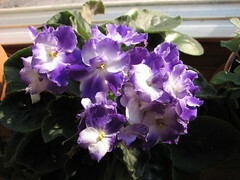 Plant I used to hate but have learned to love: African violets. They were too frilly for my taste, like peonies and roses, but after discovering I'm good at them I decided they are worthwhile after all and now I have five. Runner-up: I have learned that I don't hate all Sansevierias, just the ones with the yellow margins. Those are so ugly. The Hahnii above, now that's a cutiepie. So there you have it! Thanks to Mr. McGregor's Daughter for suggesting the idea, and for giving me the motivation to update that list! ETA: It's less than a week later and the count is already up by 8, plus I spent part of the weekend taking cuttings and dividing clumps. I would worry that I'm plant-OCD but there are whole parts of the year (usually late summer) where I don't much care about plants, indoor or outdoor. It's seasonal OCD, and I can live with that. It's great you have so many! I wish I had room for over 80 houseplants! And you're also lucky to have the touch with African violets. I think they're pretty but inevitably I kill them. Groundhog Day is a big favorite around here too. I grew up near Woodstock & used to go there often, so it's fun to watch for that aspect too. I think Woodstock Willie won't see his shadow today. Thanks for participating in the census. 86 sounds like a lot to me. I can see why you like the Bowiea (aside from the name), it's really funky. Maybe I should send my African violets to you. I'm sure they'd be much happier. Heck, even if you've only seen the movie once, you've seen it like 4 times (which, admittedly, was more than enough for me personally!). Do love Cher, though. 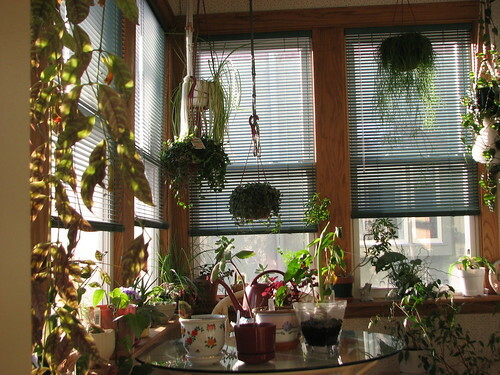 :) My you have a lot of houseplants. Even *including* plants that I put outside over summer and am really only overwintering inside (rosemary, garlic chives, elephant ears, 2 amaryllises, a paperwhite, a nandina baby shrub not hardy in my zone, and 2 Norfolk Island pines), I have a total of (wait for it) 13.5 houseplants (half is a dying African violet). Whew! When I arrived at this page I had a good laugh. Groundhog Day is a favorite around here too. 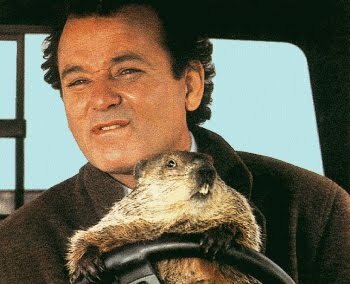 The other half often says "Don't drive angry" right out of the scene in your picture. You really have the touch with houseplants. That's a great plant room you've got there. DH chose LOST over Groundhog Day this year so we'll have to bump it to the weekend. You have a perfect place for houseplants. I go thru phases where I will collect several houseplants then I lose interest and give them away. Mostly the cats limit my indoor plants. They refuse to leave them alone. 86 is nothing to sneeze at! Looks like you've got a great place for growing them, too. Now you need to add a Kangaroo Fern to the mix. LOL. Wow! I'd never keep up with the watering of this many plants! I'm afraid I am house-plant challenged, but I've seen so many pretty African violets on different posts that I'm really tempted to go out and buy a few just to add some greenery here. I've never been a fan of sansevierias either, but I have to admit I like yours. When I was at the GPC for "Sweet Saturdays" they had a table set up where they were selling off plants they've propagated at the conservatory. I had the urge to tweet you the names and prices of the plants, but figured that may get old real quick. So, I decided to wait 'til the end of the day and write the names down of the rare plants and Email you the list, but by the end of the day all the cool plants had been sold. If you want...next Saturday I'll tweet you if I see anything that looks interesting.